All the outdoors shots were taken with a little bit of fill flash from the 580EX-II mounted on a bracket and fitted with a Lumiquest bounce reflector. Charlie McInally is another UKPM contact. This was another home-based shoot, studio in the living room and natural light in the bedroom. We met Steph through UKPM. Since she lives in Kilmarnock, we'd arranged to go to her and shoot outdoors. It started a miserable, rainy day, but that cleared after lunch and we had a successful shoot. I think I shot the whole day using the 85mm. The majority of the shots had a little bit of fill flash using the flash on a bracket with a Lumiquest bounce attachment. Three shoots lined up - Stephanie Lindsay (Thursday), Charlie McInally (Friday) and Sammi J Muirhead(Monday). We've met all three for coffee, so at least we won't be shooting from a cold "hi, pleased to meet you". Steph is in Ayrshire, so we'll be shooting outdoors at locations she suggests. Charlie is coming to us to shoot some studio stuff. 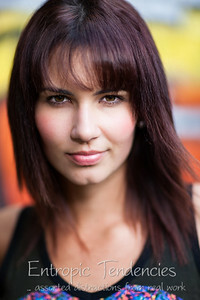 Sammi is also lined up for some studio work, but if the weather works out we'll maybe grab some shots on the way here.